Proto-Cetina/Cetina, in the southern Balkans, appears as a Bell Beaker periphery connecting the West Adriatic coast with the East Adriatic area ca. 2400–2300 BC, under the influence of Central Mediterranean Bell Beakers, whose heartlands are on one hand northern Italy and Tuscany, and on the other hand Sardinia and western Sicily (Heyd 2007). Wristguards are present in higher quantity than in northern Italy or the Csepel group, and known from the published sites both in some numbers and as single finds, in settlements as in graves. There are also triangular riveted daggers, apart from gold jewellery in a rich grave inventory in Nin–Privlaka. 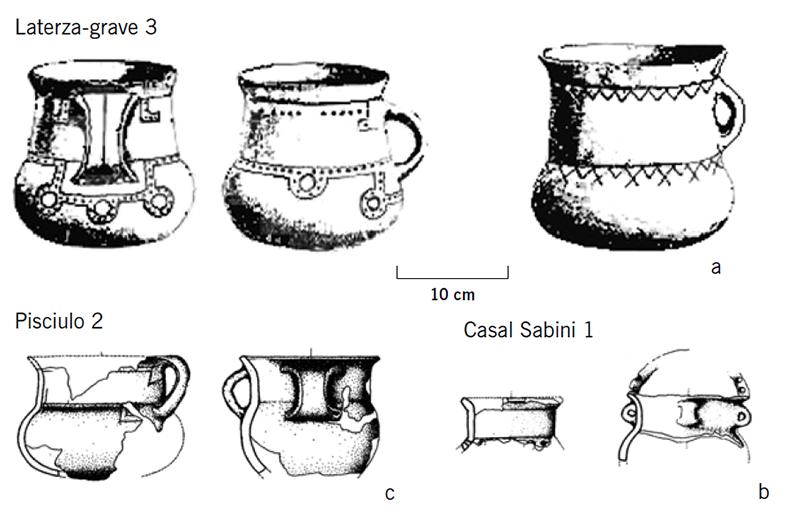 There are many undecorated bowls, jugs, and cups, proper of the Begleitkeramik of the Middle Bell Beaker period, instead of Bell Beakers, of which only two beaker derivates are found, created in contact with the Adriatic variant of Vučedol (Heyd 2007). Tumuli of several meters in diameter, primarily of stone, can have a kerb of large stones. They contain usually a rectangular cist grave made of stone slabs, with a stone-covering slab. A single person buried in a contracted position on the left or right side is the standard. Cremation is mixed with inhumation, showing local differences in the burial ritual. Tumuli with no remains are common, probably representing cenotaphs (Teržan and Karavanić 2013). Cetina is therefore a syncretistic culture developed probably in combination with local cultures by migrating Bell Beakers, likely from a region near the Adriatic island of Palagruža, where Bell Beaker elements are predominant: wristguards, comb–stamp decorated pottery sherds with Bell Beaker decoration, and flint-inventory with characteristic arrowheads typical of Mediterranean Bell Beakers (Heyd 2007). Characteristic settlements, especially in the western Balkan hinterland, suggest that Cetina settlers were nomadic herders. The twenty-five Cetina sites comprise the whole northern and western Adriatic shore, stretching from Trieste in the north to the ‘heel’ of southern Apulia, with concentrations around the Daunia peninsula and the Apulian plain, with related pottery in the Corazzo–Zungri settlement showing extension towards Calabria and further inland, including also a northern site in the province of Trento. Its influence is thus felt along the Adriatic from Istria and the karst hinterland of Trieste to the Peloponnnese and the southern Apennines, but also to the western Balkan hinterland, where no settlements (other than cave shelters) are known (Heyd 2007). Chronologically, it seems that first maritime beakers appear ca. 2500 BC or shortly after that in south and south-east Italy, impacting native cultures like the Laterza–Cellino San Marco culture. After that, Italian Cetina appears ca. 2500–2300 BC, under the most recent Bell Beaker influence with the stamp and puncture decorated vessels preceding the classic (East Adriatic) Cetina phase (Figure 67) and its typical framed decoration that appeared later (Heyd 2007). Figure 67. Cetina-type pottery from Apulian sites. Image modified from Pacciarelli, Scarano, and Crispino (2015). The term Cultura dei castellieri or Kašteljerska kultura is used to define the Bronze Age culture with characteristic settlements particularly prevalent in the northern and north-eastern Adriatic region. The culture features castellieri-gradine, settlements in strategic positions that could be easily defended—like prominent hills, edges of high plateaus, tongue-shaped promontories on valleys—fortified with dry-stone ramparts adapted to the terrain, either surrounding the settlement or built on the more accessible places (Mihovilić 2013). It features a well-organised society with knowledge of building methods. Settlements located on tops of hills or other selected sites were levelled, with stone being broken and extracted. Plans show a proto-urban organisation, with the larger settlements featuring a separated fortified citadel or acropolis containing large structures, covered doorways, narrow passageways, etc. Labyrinthine entrances became with time an additional way to secure the settlements, as was the additional earthwork with sharp upright stones found some 10 m in front of the rampart circuit in certain settlements (Mihovilić 2013). Findings in central areas confirm they were inhabited by a ruling elite, supporting the existence of a stratified society. All areas surrounded by ramparts—which ranged from 2/3 to 10 m in width, and from 3 to 6/10 m in height—were intensively settled. Apparently, houses had rectangular, 1m-high stone foundations often carved into the level bedrock, complemented with a wooden superstructure. Cavities hollowed out from the bedrock may have served to collect rainwater from house roofs, which would have been necessary since the Adriatic has a problem of water supply (Mihovilić 2013). Castellieri appear to have formed centres of specific surrounding microregions, potentially specialised and forming alliances with others. Near the castellieri, short-lived settlements are known from caves and rock-shelters, and the importance of cattle-breeding supports its potential link to the main settlements. Grinding stones confirm the importance of agriculture, and vine-growing areas are also found. Long-range trade contacts are evidenced by loaf–of–bread idols (particularly important in the Lower Danube, Moravia, and northern Italy), amber beads (typical of southern Únětice and Tumulus), and finds of bronze weapons of south-eastern (Aegean) and north-western (Rhône, Italian) origins (Mihovilić 2013). Inhumations in stone cists covered with stone tumuli or in small cemeteries beside the main entrance are the standard from the EBA on. The fortified settlement at Monkodonja, characteristic of the culture, shows two peculiar tombs integrated into the monumental labyrinth-like main entrance, containing rectangular stone cist graves. They represented probably special burials of selected members of the local elite, with cult of the forefathers (Teržan and Karavanić 2013). The emergence of cremation marks a crisis during the Urnfield period, with abandonment of some settlements and a new wave of castellieri being established, at the same time as Proto-Villanovan and Late Helladic IIIC findings appear in its material culture. The Posušje or Dinaric culture of the Dalmatian hinterland lasted from the EBA to the MBA, and features small hill forts of a mean 50–100 m2, elevated settlements fortified with powerful walls, in some cases including bastions, made in the dry-stone technique. Larger settlements (ca. 150 m2) have an interior with additional walls, showing a complete fortification with an acropolis. Posušje hill forts shows parallels with the Castellieri culture, and its sedentary farmers (primarily agriculturalists) coexisted with the Cetina culture of nomadic herders in the same geographical area. In the Adriatic and its hinterland, inhumation is the main rite, although in some places cremation was also used (Teržan and Karavanić 2013). In the Late Bronze Age (ca. 1200–800 BC) human occupation in the valleys (polja) of the Dinaric Alps in Croatia, like Gacka to the north and Ličko to the south, show a change from ephemeral sites to increased burial activity, including inhumations under earthen and stone tumuli, and the emergence of hill forts, which proliferate near mountain passes and river access points, suggesting their need for defence and control of resources. The largest hill forts in each valley acted as a centralising force for smaller forts and settlements nearby (Zavodny et al. 2018). The end of the Bronze Age marks a dramatic change in regional burial practices to large communal necropolises close to hill forts, with the appearance of Baltic amber in graves highlighting changing sociopolitical and economic forces, including the participation in interregional trade networks, marking the start of an integrative regional culture known as the Iapodians, who existed until the Roman conquest (ca. 35 BC). This period marks a trend towards intensified and expanded animal management practices, with cattle and sheep–goat herds becoming larger and more numerous, necessitating non-local pastures, which were found in the hillsides around valleys or into even higher mountain areas, in order to preserve valley bottoms for agriculture (Zavodny et al. 2018). The continental areas of the western Balkan Peninsula south of the Pannonian basin and west of the Dinaric mountain range form part of an extensive ore-bearing region, probably exploited throughout the Copper and Bronze Ages. The Somogyvár–Vinkovci culture dominated to the north, as a transitional cultural phenomenon related to traditions of the preceding Vučedol culture. Settlements were usually located on elevated positions near waterways, including artificial heights like tells, usually without fortifications. Houses were rectangular, above-ground, single-roomed constructions built with load-bearing wooden beams. Dug-in structures were also common, potentially as cellars or storage pits. Subsistence economy was based on stockbreeding, mostly cattle, but also pigs and small animals, and a mainly sedentary way of life can be assumed (Teržan and Karavanić 2013). The Vatina culture (ca. 2100–1600/1500 BC) represents a significant cultural shift in the whole region. It is represented by few large fortified ‘central’ settlements dominating over microregions. This contrasts with previous periods, where large numbers of smaller, mostly unfortified hamlets predominated. Settlements were surrounded by a defensive ditch and earthen bank with palisade, with some kind of ‘suburb’ or outlying settlement outside the defences. The fortified area showed a proto-urban organisation, with standardised rectangular houses arranged along narrow streets, with some broader ones representing the main corridors. The house interior fittings showed a high level of living style. Up to one thousand people could inhabit the whole settlement area (Teržan and Karavanić 2013). In the mountainous parts, in the middle of ore-bearing areas, contacts and synthesis are seen between the Mediterranean and areas of Carpathian–Danubian cultures, forming the so-called ‘transitional zone’ between Pannonia and the Adriatic. Small, elevated settlements or hill forts with natural defences are prevalent from 2000–1600 BC, with high population density and a clear sociopolitical connection with Vatina, reflected in the proto-urban organisation and layout of settlements. Traces of metallurgical activity are found in these settlements (Teržan and Karavanić 2013). During the MBA, smaller unfortified settlements replace the previous large Vatina settlements, mainly along the edges of the plateau and on lower-lying terraces, at roughly equal distances from one another, mainly small hamlets with 2–6 buildings up to 50 m from one another, indicating individual farms. This new economic base and spatial utilisation suggests an organised colonisation of the area, possibly with a hiatus from the previous Vatina culture (Teržan and Karavanić 2013). Cremation burials were prevalent, as in many groups in Pannonia and the western Balkans, but there were also individual inhumations featuring weapons (swords and battle–axes) already during the EBA, without a direct relationship to the Tumulus culture, which suggest some sort of convergence phenomenon. This trend is later kept in the cultures succeeding Vatina, and spreads into more southern groups like Donja Brnjica–Gornja Stražava group (Teržan and Karavanić 2013). During the classic Urnfield period, new groups featuring large flat urnfields with hundreds of graves settle the central Danube basin up to the south in modern Slovenia, showing strict gender differentiation and social stratification. In central and eastern Serbia, the surviving groups succeeding the Vatina culture during the LBA show tumuli as the standard burial ritual, but cremation is also common. Material culture points to strong contacts with Glasinac, but also with Danubian, other western Balkan, and Aegean cultural spheres (Teržan and Karavanić 2013). The Glasinac culture evolves from Vatina in modern central Bosnia and western Serbia, and continues into the Early Iron Age. This regional variant shows mainly earthen tumuli of ca. 8–12 m diameter found in large groups. Mounds contain usually several graves with pebbles on the base, lined and covered with stones, with the dead in an extended or slightly contracted position, but there are also cases of cremation. The erection of mounds suggest the use for family burials for one or two generations, and together with rich assemblages they evidence social stratification and cult of the warrior (Teržan and Karavanić 2013). Further to the south, the Paraćin group (along the course of the Morava) and the Donja Brnjica–Gornja Stražava group to the south and west of Paraćin show mainly cremation and urn burials coexisting with inhumation, with a complex burial rite featuring special constructions of stone slabs and circuits of stones, and grave pits lined and covered with stones suggesting graves or clusters of graves under small tumuli. Weaponry and prestige goods in inhumations suggest that they were representatives of the social elite, possibly of foreign origin. Tumuli are the dominant form of grave monument, with no or scarce grave goods, and warrior cult manifested through weaponry in assemblages. Apart from local differences (such as the body position), the burial rite shows a tradition rooted in the Cetina culture. Nevertheless, some MBA groups in the Adriatic hinterlands show collective or double burials with specific rituals that probably reflect some degree of isolation of different communities (Teržan and Karavanić 2013). To the west of the Middle Danube, the Virovitica culture replaced the Litzenkeramik group of Somogyvár–Vinkovci, and expanded further to the south, with numerous settlements located in plains on low elevations near waterways, sometimes with defensive ditches fortified with a palisade. Houses were single-roomed buildings joined in small, dense groups around a courtyard area that contained several hearths or ovens, probably representing farming settlements (Teržan and Karavanić 2013). The LBA marks another change in settlement pattern, with a large number of MBA settlements abandoned. The Kalakača–Bosut horizon shows the emergence of settlements arranged in groups of several small rectangular buildings representing individual farming households. Basarabi-type pottery appears from the eastern Balkans, and the synchronic radical reduction of settlements—with the survival or emergence of a few on fortified positions—supports an invasion of nomadic horsemen from the eastern steppes (Teržan and Karavanić 2013). West of the Danube, an increase in occupation is seen during the Urnfield period in the lowlands along watercourses, coinciding with an increase in metallurgical production and extensive trade, probably led by specialised craftsmen and travelling prospectors. Two main types of settlements can be distinguished: open or scattered settlements without defensive systems, probably individual farmsteads; and fortified, central settlements with proto-urban features, especially after ca. 1000 BC, located primarily on elevated outcrops or high river terraces. These lasted until the Iron Age, when new fortified settlements, hill forts, formed at elevated spots, leading to a new territorial organisation (Teržan and Karavanić 2013). It remains unclear if Messapic expanded with Bell Beakers migrating through the Italian Peninsula, or rather southward through the eastern Adriatic coast. Based on the connections of the Cetina culture with Bell Beakers from the Italian Peninsula, and the potential nature of Messapian as a North-West Indo-European dialect, it seems more likely that Proto-Messapic speakers expanded first southward from the Alps into mainland areas east of the Appennines, and were later replaced and displaced to the south-eastern corner with migrations of Italic peoples. Two individuals from Early/Middle Bronze Age from Veliki Vanik in Split-Dalmatia (ca. 1630–1510 BC) include one of hg. J2b2a-M241 (formed ca. 118000 BC, TMRCA ca 7800 BC), probably corresponding to subclade J2b2a1-L283 (TMRCA ca. 3400 BC), since basal clades are found today in modern populations of southern Italy and Anatolia. These and a later sample of the Late Bronze Age from the Jazinka Cave, near Nečven (ca. 780 BC) show similar ancestry to other available Balkan samples, but with increased Steppe ancestry (ca. 35%), and slightly less WHG (although similar EHG) contribution compared to other Early Bronze Age individuals from the Balkans. Interestingly, this haplogroup, which probably arrived in the Balkans from a westward expansion through Anatolia during the Chalcolithic or Neolithic, is found later in Armenia MLBA in an individual with Steppe ancestry (see §viii.14. Caucasians and Armenians). The finding of haplogroup J-M304 among Mycenaeans (see §viii.12. Greeks and Philistines) further suggests a relative infiltration rather than a massive migration of Yamna male lineages in the southern Balkans, probably due in great part to the higher demographic density of south-eastern Europe (Müller and Diachenko 2019). In the south-east, Messapic-speaking Iapyginians from Botromagno (ca. 7th–4th c. BC) show mainly mtDNA subclades H and U, while the later Romans from nearby Vagnari (ca. AD 1st-4th c.) show more varied mtDNA haplogroups, with closer affinities to eastern Mediterranean populations. This replacement may be associated with the migration of Romans from central and northern Italy, but is likely to represent a direct gene flow from the eastern Mediterranean due to immigration or slave trade (Emery 2018).